Don't be fooled by the picture or price of an imported product! It's very easy to be fooled by "imported product descriptions and pictures". They only provide a paragraph or very little product information, and what they do provide is deceptive. We provide over 50 pages! 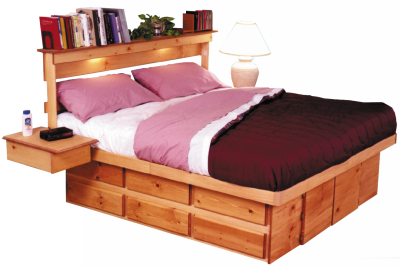 Nearly all storage beds you see on the internet or in stores are imported. They have paper-thin vinyl glued to low-grade particle board, low quality drawer slides, and very short warranties (1 year or less) due to particleboard construction. The sellers of these products are not manufacturers. They are importers. Don't be fooled when they omit details like: where it's made, what it's made of length of warranty, etc. Don't be fooled by a picture. Particleboard products quickly fall apart. Don't get stuck with a particleboard product that is too heavy, costly and difficult to return! Don't be fooled by retailers like Walmart, that promote imported, particleboard products. We need to support America, not China! Our bed is, by far, the best! Our real wood Products are backed by a 50 year warranty, and are made in the USA by craftsmen who care! We have been in business for 53 years. Our 50,000 square foot, state-of-the-art factory is totally dedicated to making Ulimate Bed Products. No other bed provides its unique benefits, quality, or dollar value. Don't make the mistake of falling for the vinyl-wrapped, particleboard imports with their deceptive product information! I wanted to commend you on a superb product, carefully manufactured, packaged and delivered. Your bed is "magnificent". The people who helped us assemble the bed were so envious... I love it! It is indeed a rare pleasure to find a superior product that meets or exceeds all expectations. 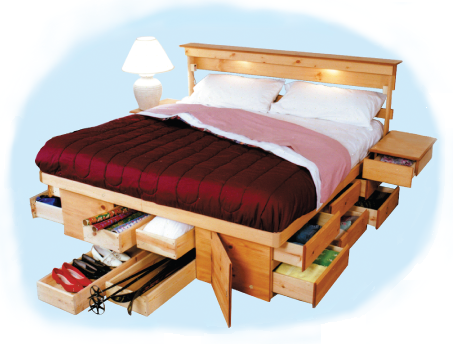 I can't tell you how impressed I am with the Bedroom Organizer. Absolutely awesome. I'll be sure to recommend your company. We love our bed and the drawers make my life so much better. Everything has a place and I know where it is. Thank, you for the excellent workmanship and design. Bravo -- your product exceeds all my expectations. I ordered the Anderson Bed and may I say it is totally beautiful. I am totally and completely pleased. 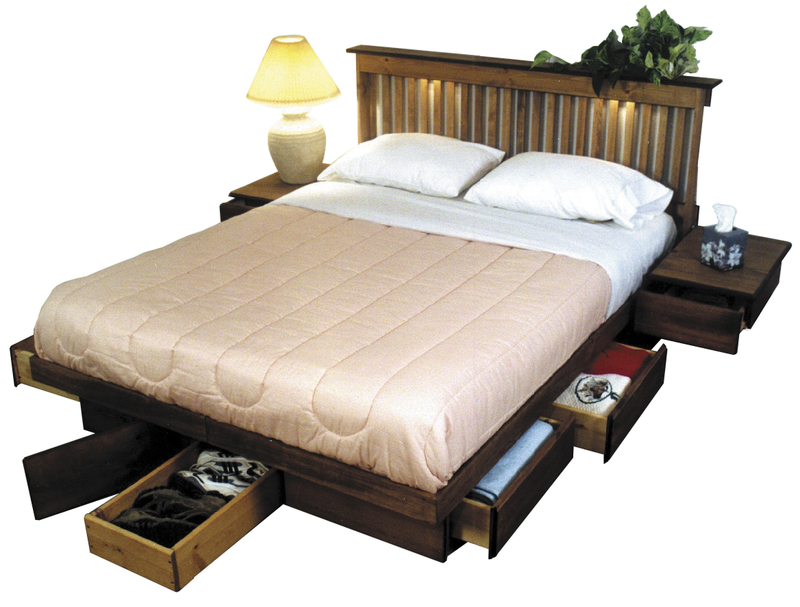 Our 12-Drawer Underbed Dresser is our most popular model. It's the quickest, simplest and least expensive way to add storage to any home. It's the perfect height and provides loads of storage. 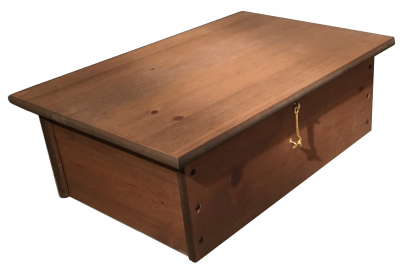 It has 6 large drawers on each side for folded items, and can have up to four 4-1/2 foot long End Drawers to hold your long, bulky, odd shaped items. One drawer can hold up to 20 pairs of ladies' shoes! 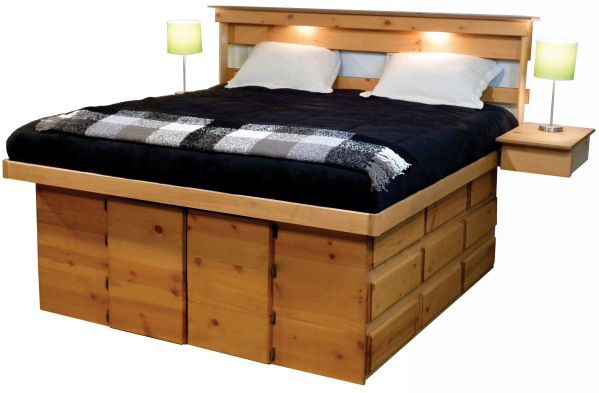 It eliminates and saves the cost of the box spring, bed frame and 3 wall dressers. 1,000 Lb. Weight Capacity! It saves space and cleaning, and more than pays for itself from savings. Four 4-1/2 Ft. End Drawers "Optional"
Transform a Small, Cramped Bedroom or Dorm Room into a Neat, Beautiful Organized Room! If your bedroom is a small room, how and where will you store all your stuff. In storage boxes? Duffel bags? Shoe racks? Laundry bags? Storage bins? Underbed bags and boxes? All of these items take floor space, are inconvenient to use, make the room messy and are a pain to clean around. 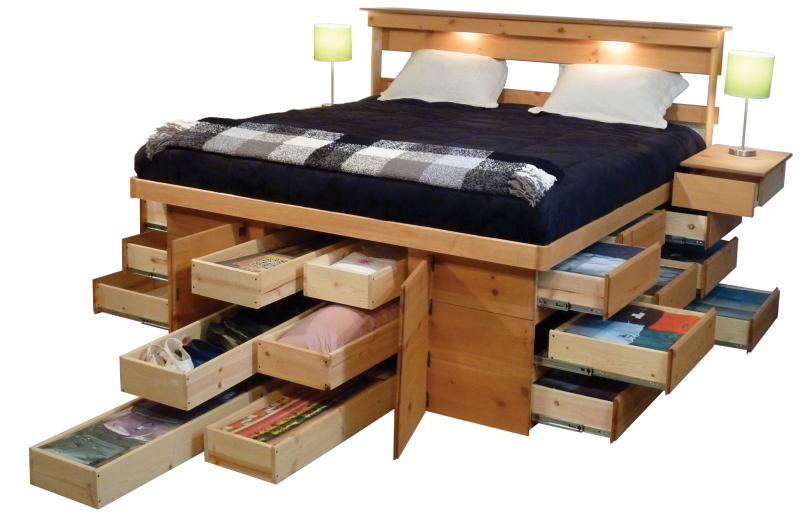 Our Ultimate Twin Bed can solve your space problem! It's beautiful, it's compact and it stores all your stuff without using one inch of floor space! It keeps everything neat, clean and perfectly organized. It has 9 large drawers for all your folded items and 3 giant drawers 4-1/2 feet long, to store your long, bulky, odd-shaped items. They're also perfect for shoes, purses, guns, bedding, etc. Drawers can open from either side to fit any room arrangement. To get quote, scroll to bottom of page. 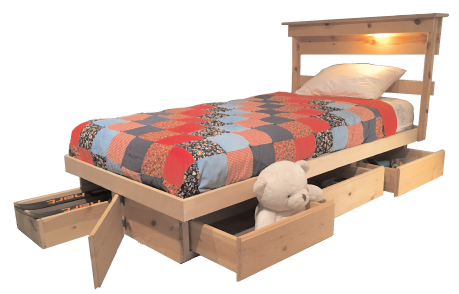 Three 4-1/2 Ft. End Drawers "Optional"
This Bed Can Increase in Size as Your Child Grows! This is a perfect bed for a small child. 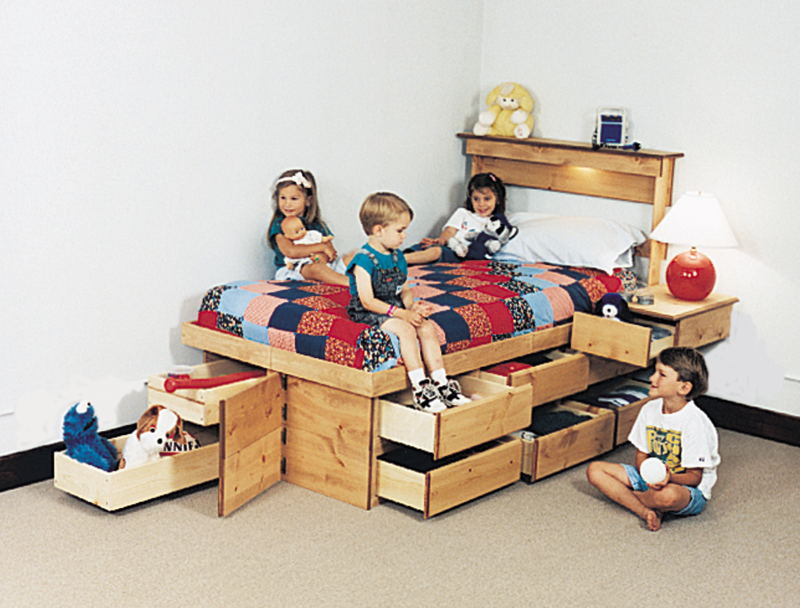 It eliminates the need for a wall dresser, producing more space for playing. It has a place for clothes, toys, games and long, bulky, odd-shaped things too. There are also other optional items. It's a perfect product for teaching your child how to organize and put things away to keep the room clean and neat. 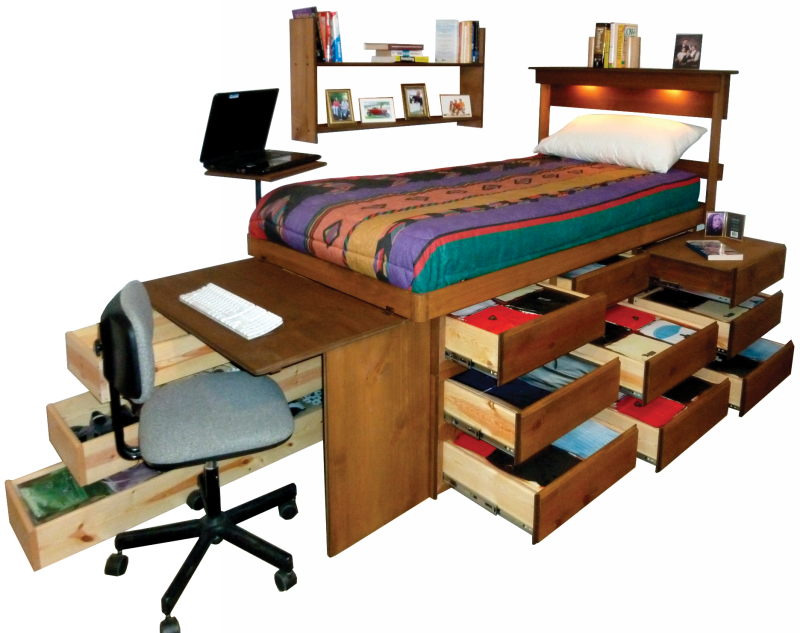 As your child grows older, the 3 drawer dresser can be changed into a 6 drawer dresser, and when it's time to go to college, it can be changed into the Ultimate 12 drawer dorm bed. After college it can be changed into two beds - a three drawer twin and a 6 drawer queen or king. 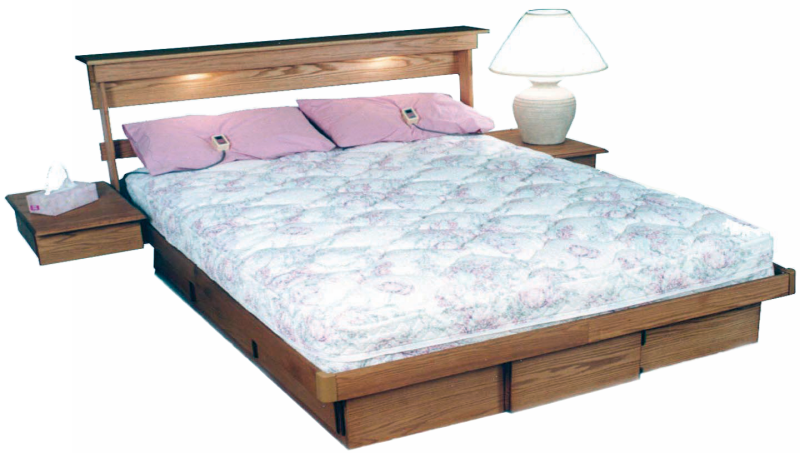 This bed is made in the USA to last a lifetime! Ladies - Get Rid of Hot Flashes! Beware! "Bed-in-a-box" foam mattresses, sold on the internet, are merely slabs of foam, zipped into a thin mattress cover. They are severely compressed (by machine) to fit into a small shipping carton to lower shipping cost. Compressing can damage foam. When the package is opened, the foam expands into a mattress. Your body requires quality rest. Don't sleep on a stack of foam! These mattresses have no operating mechanism to precisely adjust the mattress to your individual weight, shape or health condition, which is crucial to obtain restful sleep. Note: These mattresses cannot be re-commpressed if you want to make a return. Bed-in-a-box foam mattresses don't provide any of the unique benefits of the Pure Health® Mattress listed below. Has all the best "comfort technologies"
age. the comfort has been unsurpassed. Thank you for such as awesome product. I don't want to get out of it every morning. This bed is perfect. I previously owned a Number Bed Mattress and your mattress is 10 times better. I have never slept in greater comfort. My better half agrees. Thank you both and all your dedicated staff. We love our new bed. I had not been able to get rid of my sore back for years, but that is no longer a problem. My husband and I are sleeping a lot better and sounder than we did. Thank you for making such a fine product. What a great bed!! By the way, I checked out the Number Bed too. I am really glad I decided on yours. I think it's far better. We sure have enjoyed our Pure Health Mattress. No pressure spots - just comfort. My husband and I agree your bed is the most comfortable bed we have ever slept on. The mattress is wonderful. I found it even better than my Number Bed Mattress. My wife and I are immensely satisfied with the Pure Health Mattress. Count us amoung your most satisfied customers. We find the Pure Health Mattress to be prefect. It gives my back good support, and herside can be a little softer. It's the most continually comfortable mattress we have ever owned. The adjustable Pure Health Mattress has been a joy. We have not had a bad nights sleep since we purchases it.